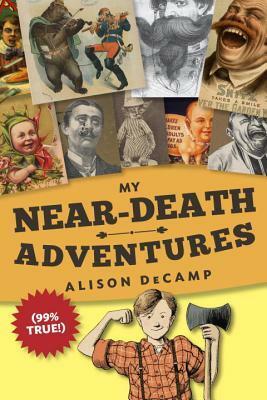 As a member of the Fearless Fiteeners, I was able to read an ARC of Alison DeCamp’s middle grade historical novel, My Near-Death Adventures (99% True) (2/24/2015; Crown Books for Young Readers). ARCs (Advanced Reader Copies) are the uncorrected proofs that are sent to reviewers, librarians, and book bloggers to promote the book. My fellow fifteeners and 2k15 classmates are sending their ARCs on tour, which allows us a sneak peek at these upcoming new releases. I’ve decided to let you all know about the ARCs I’m reading to help support my 2015 debut colleagues. Here’s the description: It is 1895. Stan is on a mission to find his long-lost father in the logging camps of Michigan. And he’s embellishing all of it in his stupendous scrapbook. There are many things that 11-year-old Stanley Slater would like to have in life, most of all, a father. But what if Stan’s missing dad isn’t “dearly departed” after all? Who better to find this absent hero/cowboy/outlaw than manly Stan himself? Unfortunately, Stan’s fending off his impossible cousin Geri, evil Granny, and Mama’s suitors like Cold-Blooded Killer Stinky Pete. If only he could join the River Drive, the most perilous adventure of all, where even a fellow’s peavey is at risk. It’s a wild ride for Stan as he finds out about true manliness. But at least Stan has his scrapbook, full of 200 black-and-white 19th-century advertisements and photos, “augmented” with his commentary and doodles. Stan’s tale will leave readers in stitches, but not the kind that require medical attention. What I liked about it: I love Stan. How can you not? He’s funny, charming, and vulnerable all wrapped up in a super manly package. Just look at those muscles on the cover! Seriously, Alison DeCamp had me laughing from the start and throughout the novel. I stopped writing notes in the ARC because I would have filled the page with LOLs and smiley faces. Really. Reading DeCamp’s debut novel is like a master class in “voice” because she Stan’s is distinct and doesn’t waver at all throughout the novel. This is a sweet, fun story about a boy trying to become a man that will be loved by many. If you are a middle grade parent, teacher, or librarian, this one should definitely be on your shelf. About the author (from her website): Alison grew up in the Upper Peninsula of Michigan where people say “Yah, eh?” and “Youse guys” and dress in many layers for seven months of the year. Unlike Stan, the hero in her book, Alison had indoor plumbing and more than two pairs of pants. However, she might have worn the same sweater every day in fifth grade. The daughter of a hardware store owner (and reluctant, occasional employee) Alison spent too many school breaks attending ACE Hardware conventions and not enough at Disney World. After graduating from Michigan State University, Alison began teaching middle and high school English. Here she dealt with students chewing tobacco during one of her amazing lessons as well as a questionable principal who once pulled her out of class just to get Alison’s opinion on her new skirt. After eight years, Alison quit teaching to stay at home with two babies who are now two teenagers. Babies and teenagers require almost the same amount of work. During this time she taught herself to make glass beads and jewelry which she sold at local galleries. She now can occasionally be found “working” at Between the Covers bookstore in Harbor Springs or grocery shopping. Her people like to eat.